Registration begins May 31, 2018 to attend the conference! The 2018 ATHE Conference focuses on revolution, resistance, and protest, and the multiple ways these ideas – and the actions that spring from them – impact theatre in higher education. Drawing on the city of Boston for its historical significance in the American Revolution, and as a site of both academic excellence and artistic innovation, we aim to explore revolutions at the multiple intersections of politics, theatre education, and professional practice. Revolution and resistance are tools employed combat injustice and inequality. However, these tools can be used to effect change in any direction, to create more open and equitable societies, or less. In the 2016 US presidential election and its wake, and heading into 2018 midterm elections, the concept of revolution has been used by both left and right. We will consider various meanings of revolution, in scholarship and performance as well as in our work as educators with students in the classroom, rehearsal hall, and in the larger context of college campuses. The conference theme invites examination of ways in which electoral representation resonates with theory and practice in theatre-making: How does representation in politics relate to equitable and fair casting and employment practices? How do changing practices require revolutions in production methods and pedagogies? How might theatre scholarship serve a meaningful public function, engaging with performances – both artistic and civic – that surround us? How might we create art that is aesthetically revolutionary and that activates audiences to make lasting social change? Boston’s history allows us to consider performance and revolution in uniquely complicated ways. Events of the American Revolution are memorialized throughout the city in museums and public monuments, many involving performed reenactments. The site of the Boston Tea Party, a protest by white men who masqueraded as Native Americans to resist “taxation without representation” by the British, is marked by a museum only a short distance from the conference hotel. However, other revolutions remain unmarked, such as the systematic and violent dispossession of the Wampanoag, Nipmuc, Massachusett and other nations of the Dawnland by European colonists. In contemporary US politics, the Tea Party has itself become a kind of costume for protest. Groups claiming its ethos arguably play with tropes of revolution alongside those of racial superiority, misogyny, and nativism. Consideration of how contemporary and historical enactments of US foundational stories perform race and gender, as well as erasure of the land’s history before colonization, raises complex questions concerning representation and revolution in this context. These questions resonate in turn with debates prompted by popular theatrical productions like Hamilton, which not only evidences revolutions in storytelling and casting practices, but famously inspired a twitter war between artists and politicians about the role of theatre as “safe space” or platform for protest. We see questions about safe space and protest rising on college campuses: demonstrations and counter-demonstrations by right and left, changing policies regarding academic freedom, the development of professor watch lists, conceal and carry laws, designation of sanctuary campuses, and the ongoing impact to students especially vulnerable under new policies, including undocumented and transgender students. These concerns intersect with urgent questions over funding for the arts and for higher education, the cost of education, and perpetuation of economic and institutional inequities on racial, ethnic, and gender lines. Join us in Boston in 2018 to explore the precarity and potency of theatre in higher education to protest oppression and advance revolutionary change. The Rookies has officially launched and we will be taking submissions starting March 7, 2018. This is a great opportunity for your students to win paid internships, prizes and scholarships. It’s free to enter and we don’t use students work for commercial gains. This year’s categories are: Animation, Film Production, Graphic Design, Illustration, Industrial Design, Motion Graphics, Next-Gen Gaming, Photography, Visual Effects, Virtual Reality and Web & Mobile. Life, the Universe, & Everything 46: The Mario K. “Doc” Smith Symposium on Science Fiction and Fantasy is looking for 40-minute papers for the 2018 conference. • Literary criticism/ analysis of works by our guest of honor, Todd McCaffrey, or of the Pern series in general. Submit full papers for consideration to LTUE-Academics, c/o Marny Parkin, 1063 JFSB, Provo, UT 84602 or email electronic submissions as RTF files to marny_parkin@byu.edu. Include name, phone number, street address, and email address on cover sheet. Papers submitted without contact information will not be considered. Student papers welcome. Please see ltue.net for more information. Papers must be submitted no later than October 1, 2017. Accepted papers may be published in the Proceedings volume at a later date. Congratulations to the following students who were honored last Thursday, April 13, at the Media Arts Student Awards Celebration. Each of these students received a scholarship ranging from $100 – $1000. 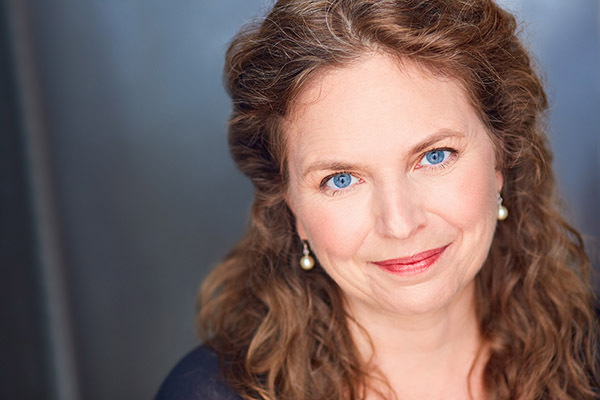 The media arts faculty announced a new scholarship, the Women in Film Award, in honor of Sharon Swenson, who will be retiring from BYU in August. Professor Swenson presented the first recipients of these scholarships at the celebration to three female media arts students. Many thanks to Kyle Stapley for arranging for the celebration. TMA 315R, Long Form Improv, taught by Patrick Livingston, will have their final performance (open to the public) on Wednesday, April 19, at 7pm in the Nelke. The actors will choose teams and a performance style (noir, sci-fi-fi, romantic comedy, etc.) out of a hat and then improvise a 45-minute play using the theme. TMA 301, Contemporary Performance Practices, taught by Lindsay Livingston, will perform a devised piece on Friday, April 21, at 7:30 pm in the Nelke. For this project, members of the class interviewed many students across campus, asking the question, “What do you wish you could say but can’t?” They then took these interviews and, using contemporary performance techniques such as physical theatre, integrative technology, and community-based theatre, devised a fully original production. Revealing some of what we think and what we decide to leave unsaid, this production invites the audience to engage with the performers in unique and exciting ways. 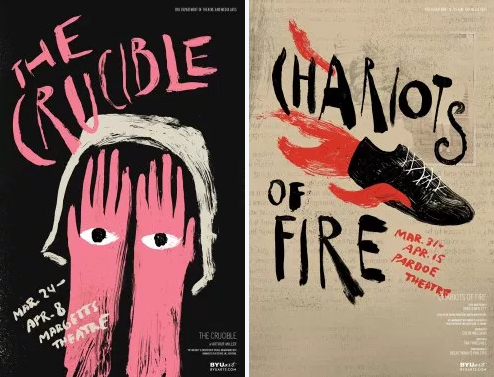 The U.S. premier of Chariots of Fire, directed by Tim Threlfall, closed the evening of Saturday, April 15, 2017 after a run of 13 performances. The show enjoyed very enthusiastic audiences, including LDS apostles Elder Quentin Cook and Elder Dallin Oaks. Often play scripts are rewritten for the screen, but in this unusual situation, a screen play was rewritten for the stage. The production introduced several innovative concepts. For instance, audiences had the option of sitting on the bleachers on stage, playing the audiences at the 1924 Olympics. Actors had to be athletes as well as dancers with some of the iconic slow motion scenes of the film choreographed for the stage instead, with stunning results. The track extended into the audience and was used as track, stage, and other scene locations. A new character was introduced to the play that was entirely absent in the film: Florence MacKenzie, the Canadian woman who proposed the solution for Eric Liddell’s dilemma at the Paris Olympics, and who became Liddell’s wife. Dramaturg Shelley Graham found connections with BYU’s 1948 Olympic participant Clarence Robison, whose Olympic Jersey was part of the dramaturgy display. Kudos to cast, crew, designers, and all those who contributed to this outstanding and inspiring production. This week, BFA faulty member, Adam Houghton, is performing in a production of A Number at the Coleman Theatre in the St. Benedicta Arts Center, which is part of the College of St. Benedicta in St. Joseph, MN. From the St Benedicta College/St. Joseph’s University website, “A Number tackles profound questions of identity and notions of ‘self’ as it unknots the tangled story between a father and son. Forty years ago Salter’s life hits rock bottom. He needed to change the way he lived and the way he was raising his son, Bernard. But Bernard had been so neglected that he was out of control and no longer the beautiful baby Salter remembered. Salter’s solution was to have the boy cloned and give the original son to the state. Salter raised the clone in idyllic conditions. Fast forward to the present day and Salter’s clone is a grown man. Disturbing hospital records reveal that not only is he a clone but he is just one among ‘a number’ of clones that were secretly made. Now the son confronts his father about the truth of his past and his identity. Tom Darnall plays the father, Salter; Adam Houghton plays the son and clones, Bernard 1, Bernard 2, and Michael Black.” Break a leg, Adam! The Crucible, directed by David Morgan, closed this past weekend. Kudos to all those involved in this outstanding production. This is the last week of the run of Chariots of Fire, directed by Tim Threlfall. The production pays homage to the original 1981 film but is also an incredibly original work that inspires the audience with the ideals and characters it portrays. Tickets still available for purchase here! We congratulate the following Media Arts Outstanding Student finalists who will be recognized this upcoming Thursday at the Media Arts Student Celebration at 11 am in F-201: Mallory Bigler, Helen Butcher, Alexis Romero, Cameron Babcock, Ian Hawkes, Matt Siemers, Lindsay Kampenhout, Shelly Rose. Many other outstanding students will be recognized and awarded scholarships on Thursday. Last Thursday, April 6, close to 200 theatre students and faculty attended the end-of-year Theatre Student Celebration. Awards were given by each of the programs and the department also recognized seven outstanding students. Donnette Perkins, the Costume Shop Manager who is retiring in June, was honored for the tremendous job she has done. Wade Hollingshaus, the chair, honored our two newest faculty members, Adam Houghton and Dennis Wright. We appreciate the good work of Lindsi Neilson and the TMA office student staff in helping with this event. Here are the students who were recognized. Congratulations to Nick Mendoza, Ken Crossley, and their team in Marketing who just received a Grand Gold Award from the Council for Advancement and Support of Education (CASE) District VII for the Theatre Main Stage posters for the 2016-17 season. The CASE website explains that, “Grand Gold Awards are presented to truly exemplary Awards of Excellence submissions. Within each broad division of the awards competition, the gold awards from the specific categories are judged against each other, and the judges from each division may award one Grand Gold Award if they find an entry to be exceptional. Not every division will award a Grand Gold Award every year.” Receiving a Grand Gold means that the poster designs are eligible to compete at the national level during the coming year. Nick Mendoza makes sure the best CFAC designs produced by our marketing office are entered into the appropriate competitions so that others in the region can see the good work we do here at BYU. Andrew Galloway (BFA graphic design ‘16) was the student designer who worked on the designs, with Nick Mendoza serving as the art director. They both worked with TMA’s Artistic Director, Megan Sanborn Jones, on the concept for the posters. The BYU Arts brochure and the BYU Jazz Ensemble “Un-common Variety Show” poster were also recognized and won Silver Awards. Divine Comedy’s “Best of Show” performed this past weekend in the JSB Auditorium. With guest Tori Pence, the troupe performed favorite sketches from the earlier shows this semester, “BYUty and the Beast” and “LA LA Land.” Tori and two current DC members, Dalton Johnson and Aaron Fielding, have signed on with Studio C. They have been involved with writing and making guest appearances. The artistic director of the current DC group is a DC alum, Kenny Baldwin, and their production manager is also an alum, Bryson Frehner. The presidency of the group includes Aaron Fielding, Alena Helzer, and Addison Jenkins, with George Nelson as the faculty liaison. This past year, Divine Comedy has added a media team to the DC organization, which has helped them release five new videos throughout the year. The media team includes media arts students Tom Hartvigsen, Cameron Babcock, Colton Elzey, Kayla Gough, Skyler Sorensen, Kaden Watson, and Melissa Young. With Tim Threlfall being instrumental in getting five new works premiering on BYU stages in the past five years, he has now added a sixth. The U.S. premiere of Chariots of Fire, directed by Tim Threlfall, opened on Friday, March 31. Tim saw the show in 2012 during the London Olympics and called Jeff Martin who worked 5 years to get clearance to perform the work on the BYU Main Stage Season. Doug Ellis, a professional scenic designer who has worked at BYU, created the unique set that includes bleachers onstage and a track running through the audience. From the iconic Vangelis music of the 1981 film to several unconventional conventions, this is a production the whole family will enjoy! The college hosted about forty members of the College Leadership Council opening night, with Wade Hollingshaus and Tim Threlfall welcoming them to the production. We appreciate all those involved with this outstanding production, including all who spent extra hours, including lighting design by Michael Kraczek (with over 200 lighting cues! ), costume design by Dennis Wright, hair and makeup design by student Marneé Porter, sound design and original score by Daniel Nash, dramaturgy done by Shelley Graham, stage management by Lindsi Neilson, music direction by Korianne Orton Johnson, and choreography by Becky Wright Phillips. Here are some local and regional news stories on the production. Last week’s forums included the following topics. In the media arts forum, Dean Duncan lead a conversation on the book media arts student received for Christmas: Robert Bresson’s Notes on the Cinematograph. The theatre forum in the Nelke, hosted by Megan Sanborn Jones, included seven reports from apprentices who served in the production shops this semester. The theatre forum in B-201 focused on all BFA majors and “preemies” (BFA Acting pre-majors). Hosted by the BFA Acting faculty, Stephanie Breinholt, Adam Houghton, and David Morgan, pre-majors and majors were reminded of the requirements and opportunities in the BFA Acting program. Appearing on the front page of last week’s March 27 Shoot online (the digital version of Shoot magazine, a well-known trade publication since 1960) is a spotlight on media arts alum Cole Webley, the director of the noteworthy 84 Lumber’s ad during the Superbowl. Read the article, which quotes Webley on his experiences in making the commercial and some of his upcoming projects, here. TMA recent graduate Dan Smith was just nominated for a Daytime Emmy as part of the team for Outstanding Sound Editing in Animation for Dragons: Race to the Edge, a Netflix/Dreamworks Animation. The Sound Supervisor was Otis Van Osten, the Sound Editor was Josh Johnson, the Dialogue Editor was Jason Oliver, and the Foley Editor was Dan Smith. Full list of Daytime Emmy nominations here. Winners will be announced on April 30. Dan currently works for Warner Bros. Studios in L.A. The Crucible, directed by David Morgan, opened last Friday in the Margetts. The script, which won a Tony Award for the Best Play in 1953, is considered one of the “central works in the canon of American drama.” (Wikipedia) One of the most widely produced texts (on stage, screen, television, and even as an opera), in the current BYU version, the director has chosen a very stylized interpretation using character masks, which provide the audience with a unique experience. From the dramaturg’s note in the program, ”[The director’s] goal is to help the audience understand the layers and masks that people—specifically the Puritan characters in this show—use to hide their true selves. . . .The truth is beneath the mask.” This is a unique and strong interpretation of a classic script; you will not be disappointed! For tickets go here. Last week in the TMA department, two forums were hosted – one for the theatre students and one for the media arts students. Details of these two events are below. The Theatre Education program hosted the theatre forum last week in response to a request from their students about how to better balance the rigorous demands on their time. Knowing the challenges all theatre students face with time management, juggling school, jobs, and productions, the theatre education area invited Melanie Tidwell, author of the book, Sacred Soul-Space: Making Room in Your Life for What You Have to Offer this World, to share some ideas on how to find better life-balance. Melanie shared many amazing ideas about differently strategies to help with more mindful life balance. About 45 people attended the forum. We appreciate the theatre education area faculty, Julia Ashworth, Amy Jensen, Teresa Love, Carrie Lopez, and Shawnda Moss for their work in responding to students’ needs. On Thursday, March 23, the Media Arts and Animation programs held a screening of the Documentary, Modifying Reality. The documentary follows a group of animation students who are trying to complete their senior film in hopes to meet the expectations of the award-winning films from the students who preceded them. The film also explores the BYU Center for Animation and how it has developed talented and marketable students. The film was directed by media arts alumni Jared Jakins and produced by Cassie Hyatt and Caitlin Stratton. Tom Lefler was the faculty mentor on the project. The film screened to a full house and included a Q&A with the film team in which the audience and team discussed the subject of the film. Congratulations to the following students who are finalists for the Outstanding Theatre Student awards: Kooper Campbell (BFA MDT), Cali Holcombe (Theatre Arts Studies, Design Tech), Bradlee Hager (Theatre Arts Studies, Design Tech), Camilla Hodgson (Theatre Education), Spencer Duncan (Theatre Education), Kristin Perkins (Theatre Arts General Studies). The winning students will be announced in the Theatre Student Celebration on Thursday, April 6, at 11 am in the Nelke Theatre. We’d also like to recognize the following milestones for these students. Bradlee Hager will be attending University of North Carolina School of the Arts in the MFA Stage Automation program. Kristin Perkins has been accepted into University of Texas at Austin’s graduate program in Performance as Public Practice.